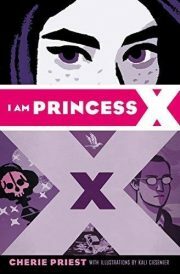 2016’s I Am Princess X is a standalone young-adult thriller by Cherie Priest. It features illustrations by Kali Ciesemier. Once upon a time there were two schoolgirls, artist Libby and writer May. Together, they created a shared fantasy world, ruled over by Princess X. Their partnership came to an abrupt, violent end when the car containing Libby and her mother went through a bridge guard rail and into the waters below. May did her best to convince herself that Libby somehow survived. By the time May was sixteen, she had to accept what everyone around her believed to be true: Libby was dead. Then the stickers start appearing in Seattle windows. 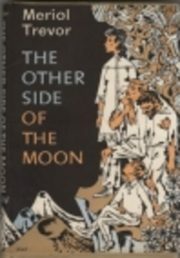 Meriol Trevor’s 1957 The Other Side of the Moon is a standalone juvenile SF novel. The Kingville Lunar Expedition did not intend to take an untrained boy on their mission to the Moon. Nor did Gil Pentfoyle intend to stow away. Having snuck on board to play spaceman, Gil fell asleep. The busy crew overlooked the boy until the expedition was well on its way to Earth’s satellite. Turns out that the Moon is a surprising place. 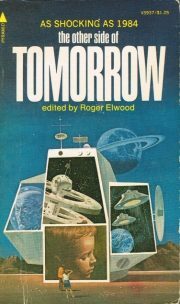 1973’s The Other Side of Tomorrow is a theme anthology edited by Roger Elwood. It’s a reasonable example of Elwood’s efforts at this point in his career. In what sort of world will the young people of tomorrow live? Nine authors imagine futures. 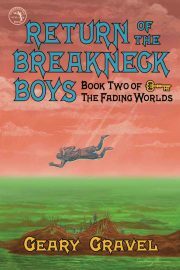 1991’s Return Of The Breakneck Boys is the second (and most recent) instalment in Geary Gravel’s Fading Worlds series. Former fix-it man Howard Bell went looking for a washroom and found a pathway to another world. It’s a dangerous world, but he has survived, even thriven. He has attracted followers, warriors of many species. Together, they form a band known as the Breakneck Boys. The Breakneck Boys are not just warriors. They are rebels against their former masters, the mysterious Keyholders. 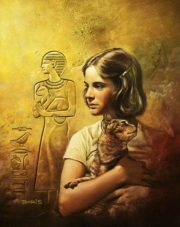 Mary Stolz’s 1975 Cat in the Mirror is a standalone young-adult novel. Erin Gandy is a grave disappointment to her mother Belle; she is deficient in the feminine virtues appropriate for women of her class. Neither pretty nor popular, Erin might well one day end up an academic or worse yet, a feminist. At least Erin can turn to her schoolmates for solace. Or she could if they did not despise Erin even more than her mother does. Spoilers for a book more than forty years out of print. 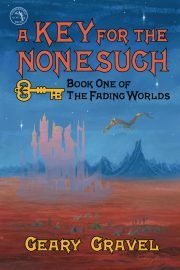 1990’s A Key for the Nonesuch is the first book in Geary Gravel’s Fading Worlds duology. A small inheritance has allowed Howard Bell to leave his unrewarding job for the life of a novelist. Years later, he has produced an unfinished novel and used up his funds. Nothing left but to parley his handyman skills into a job with Foster’s Fix-It. Determined to find a working bathroom in the unfinished building he’s been assigned to repair, Howard appropriates a set of keys. The doorway he enters takes him to a different world. 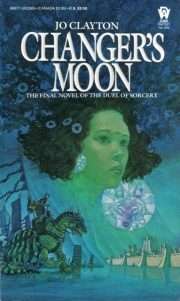 1985’s Changer’s Moon is the third and final novel in Jo Clayton’s Duel of Sorcery trilogy. Ser Noris, bored and powerful beyond reason, is nearing the end of his game with the Goddess. At stake is an entire world. Noris has succeeded in bending all but a few of the world’s mages to his will, and subjecting most of the world to his cruel, misogynistic theocracy. True, the Biserica Valley (refuge of the Goddess followers) is still holding out … but surely its fall is only a matter of time. Standing between the Goddess and the jaded wizard is a mortal woman, a green-skinned mutant sorceress named Serroi. 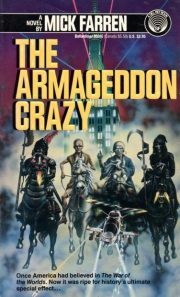 1989’s The Armageddon Crazy is a standalone near-future novel by Mick Farren. The Crash of 1998 was deliberately engineered by banks who hoped to unseat the Democrats. The Panic of 1999 was an unintended consequence. A surprisingly fragile economy imploded. The consequence of that: President Faithful’s victory in 2000. No longer do Americans have to languish under a two party system! Now they can enjoy living under a brutal theocracy. Spoilers for a book well out of print. 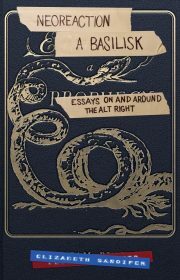 Elizabeth Sandifer’s 2017 Neoreaction a Basilisk: Essays on and Around the Alt-Right is a discursive ramble through the brambles of modern day fascism. Not an enjoyable ramble; it’s more like a tour of the Cairo garbage dumps. But it’s informative. 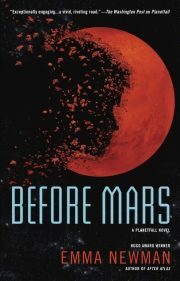 2018’s Before Mars is the third book in Emma Newman’s Planetfall series. Anna Kubrin is offered a chance too good to refuse: a chance to go to GaborCorps’ Mars base as the resident geologist/artist. This is her only chance: GaborCorps has a monopoly on Mars exploration. But … if she accepts the post, Anna will spend two years away from her husband George and child Mia. This weighs on Anna — as does her awareness that two years away from her family does not bother her nearly as much as convention demands. Despite this, there was never any doubt that she would accept; by the time the novel begins she has made the journey. 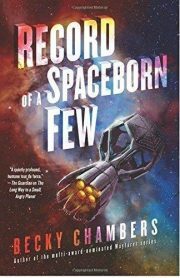 2018’s Record of a Spaceborn Few is the third volume in Becky Chambers’ Galactic Commons series. Having ruined the Earth, humans mined the Earth’s cities and turned them into a vast interstellar fleet. The Exodus Fleet’s design proved surprisingly robust; not only did the fleet survive centuries and light-years, the people riding the ships neither went mad nor devolved into cannibalistic barbarians. The Exodus Fleet was an impressive achievement. Even if the technology involved was hilariously backward by galactic standards. If only humans had encountered the galaxy-spanning Galactic Commons (GC) before the Fleet set out, the whole endeavour might have been unnecessary. As it is, the human race was allowed to join the GC as a very junior member, while the aging Fleet was graciously permitted to park itself in an otherwise useless stellar system. 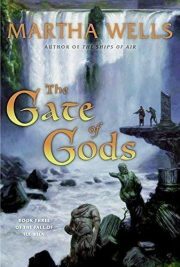 2005’s The Gate of Gods is the third book in Martha Wells’ Fall of Ile-Rien trilogy. Ile-Rien has fallen to the mysterious, implacable Gardier. Tremaine Valiarde managed to escape. She and her handful of allies — some from Ile-Rien, some from another timeline, and one ambiguously alive sorcerer — have taken refuge in allied Capidara. There they hope come up with a plan for defeating the invaders. But it turns out that the Gardier have infiltrated Capidara. The supposed refuge is in no way safe. 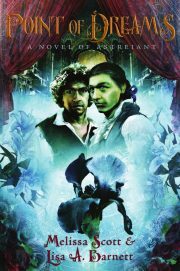 2001’s Point of Dreams: A Novel of Astreiant is the second volume in Melissa Scott and Lisa A. Barnett’s Astreiant series. 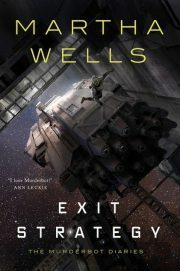 2018’s Exit Strategy is the fourth volume in Martha Wells’ Murderbot Diaries series of novellas. Returning from its field trip to Milu, Murderbot covertly accesses local security networks and discovers that there is a security detail waiting for the ship on which it has stowed away. Further probing verifies that, yes, the detail is waiting for Murderbot. It’s not the worst news Murderbot has ever heard. In fact, it’s not even the worst news Murderbot has heard that day. Maldoror_Chant’s 2017 Freeport is a fanfic set in the world of Mobile Suit Gundam Wing. The grand conflict in MSGW is over. The heroic terrorist protagonists of MSGW now must find new roles for themselves, preferably roles that do not leave a swath of death and property destruction in their wake. Chang Wufei’s solution is to become a cop. He is dispatched to problem spot after problem spot, by a federation government striving endlessly to keep discord from boiling over into open chaos. Intrepid, uninhibited by petty bureaucratic rules, Wufei lives on a knife edge: he must be useful enough that he will not be cashiered for his frequent use of excessive force. Assigned to bring a hitman known only as Carver to justice, Wufei recruits his old ally Duo. Duo has become a borderline criminal who operates out of the colony of Freeport — which is Carver’s last known destination. Wufei hopes that Duo’s connections will allow Wufei to nab Carver. 2013’s A Natural History of Dragons: A Memoir by Lady Trent is the first volume in Marie Brennan’s Lady Trent series. Scirland is not known for encouraging the intellectual interests of its women — not even its high-born women. Isabella, the future Lady Trent, is one of the determined few who prevailed despite all the pressures to focus on the lady-like pursuits she finds boring beyond words. Why focus on tedious social gatherings when she lives in a world full of natural wonders like dragons? Daughter of the Lilies is an ongoing webcomic. Meg Syverud writes and draws the comic, assisted by colourist Jessica “Yoko” Weaver (aka Nytrinhia). Given her druthers, masked mage Thistle prefers to perform beneficial magic: healing, plant growth, and entertaining illusions. As one of the members of Orc mercenary Orrig’s little troupe, she is valued for her lethal spells. Not the life she’d prefer, but one that circumstances have forced on her. 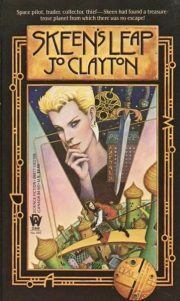 1986’s Skeen’s Leap is the first volume in Jo Clayton’s Skeen trilogy. Skeen is her own creation, from her name to her career as a star-faring grave robber, looting the relics of ancient civilizations for her own enrichment. It’s a heartwarming tale of personal re-invention. Or it was, until Skeen’s lover Tibo stole her starship and marooned Skeen on Kildun Aalda. Although the authorities do not know who Skeen really is, it’s only a matter of time before she ends up in prison or dead. Happily, there is a third option. 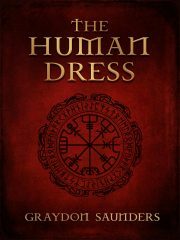 Graydon Saunders’s 2018 The Human Dress is a standalone secondary-world fantasy novel. Braemor lies just south of lands still claimed by the Walking Ice. It’s a challenging place for humans. It is barely post-glacial and home to humongous beasts that we might call “dinosaurs.” Misfortune or a bad winter could send the community into a death spiral. So could a deliberate campaign of sabotage. 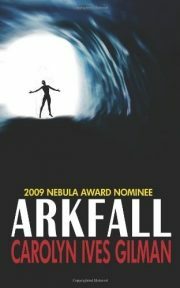 Carolyn Ives Gilman’s 2008 Arkfall takes place in her Twenty Planets setting. An ice-covered ocean world like a scaled-up Europa, Ben has no known native life. Centuries ago, humans settled inside the ice-enclosed Saltese Sea and began their long effort to transform Ben’s oceans into living seas. The Saltese Sea, which is surrounded by mountains high enough to reach the icy surface of the world, is small enough that \their Great Work will have a measurable effect within a few generations. The volcanic Cleft of Golconda =provides the energy that will maintain the new ecosystem. It’s a hard and demanding life for the human settlers. They cope by cooperating. Courtesy and non-confrontation are the rule. Loud and self-centred people are judged very harshly by their neighbours. Osaji’s sister Kitani married, leaving Osaji to care for their grandmother Mota. Frail and struggling with dementia, Mota is unable to care for herself. Osaji finds herself resenting Mota (much to her dismay, but there it is) and briefly considers leaving Ben for some other world. But a momentary encounter with a brash off-worlder named Scrappin’ Jack brings Osaji back to her senses. Imagine living with a whole world of such rude barbarians! Ansen Dibell’s 1978 Pursuit of the Screamer is the first volume in her Strange and Fantastic History of the King of Kantmorie planetary adventure series. It is also the very first Dibell I’ve ever read. Jannus encounters Lur, a Screamer, so named because they telepathically broadcast confusion and fear. The empathic Valde, a guild of female warriors and guards, kill Screamers whenever discovered. But telepathically deaf Jannus sees only a small, frail fellow human. Rather than hand the Screamer to the Valde to be killed, Jannus helps the Screamer escape. It’s a decision that will shape the boy’s life. 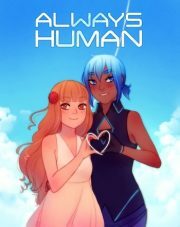 Walkingnorth’s Always Human is a hard-SF-romance webtoon. Intrigued by the oddly modless woman whose path she keeps crossing at the local transport station, VR environment designer Sunati sees the stranger’s hayfever attack as a chance to introduce herself. The offer of an appropriate mod (biomanipulating nanotech) does not go as Sunati envisioned. Instead of gratitude, the offer provokes tears. 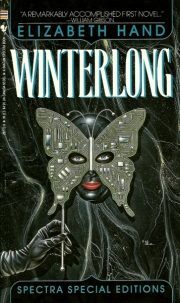 Elizabeth Hand’s 1990 debut novel Winterlong is the first volume in her Winterlong Trilogy. Nuclear war and germ warfare have left Washington a shadow of its once glorious past. A handful of administrators, descended from self-appointed curators, control the relics of America’s lost past, defending the remnants from the diseased, mutated, and simply unlucky inhabitants of the surrounding sea of ruins. A desperate woman appealed to House Miramar for refuge. Too damaged to be of use to Miramar, the woman was cast out to die at the hands of the lazars. But Miramar did keep her two beautiful children, as new Paphians for Miramar’s bordellos. Only Raphael proved suitable. Autistic Wendy Wanders was consigned to HEL. 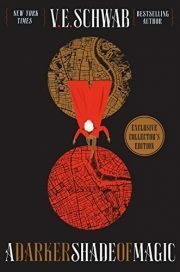 A Darker Shade of Magic is the first volume in V. E. Schwab’s Shades of Magic series. Kell is an Antari, one of two known world-walkers, able to travel between the four known alternate Londons, White, Red, Gray, and forbidden Black. His is a gift rare enough to make him a treasured possession of Red London’s Royal Family. Officially, Kell uses his gift to serve as an ambassador between the three Londons — White, Red, and Gray — that are still in limited contact with each other. On his own time Kell likes to collect souvenirs. That’s forbidden. But moving minor trinkets from one world to another seems a harmless hobby. 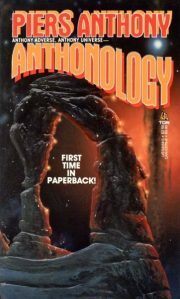 Piers Anthony’s 1985 Anthonology is a collection of his short works, with added commentary by the author’s foremost admirer, Piers Anthony. The stories are for the most part dreadful … but at least there are a lot of them.